Everyday Life » Life is messy. Clean it up. Home > Devotionals	> Life is messy. Clean it up. Life is messy. Clean it up. God responds to man’s initiative. Life is messy. What do you do when you mess up? And you will. Everyone does. What then? After you mess up, what you do is more important than what you did to mess up. Some cover up, like Adam. Some blame others, like Eve. Some deny their wrong, like Cain. Some are destroyed by their failure, like Judas. Some weep and repent from their sin, like Peter. Know this. Sin can never be ignored. Sin is not ignored by God and must not be treated casually by you. Ignoring sin is devastating to you: body, soul, and spirit. The Bible is clear about what God requires and the grace you will receive when you separate yourself from your sins. God responds to sincere confession. “May God himself, the God of peace, sanctify you through and through. May your whole spirit, soul and body be kept blameless at the coming of our Lord Jesus Christ.” 1 Thessalonians 5:23 NIV. God’s Law and righteousness demand that a wrong be made right, that restitution be given, and that relationship be restored. When you have done the wrong thing, what does God say is the right thing to do? God’s Word is really the only opinion that truly matters. “Whoever conceals their sins does not prosper, but the one who confesses and renounces them finds mercy.14 Blessed is the one who always trembles before God, but whoever hardens their heart falls into trouble.” Proverbs 28:13-14 NIV. 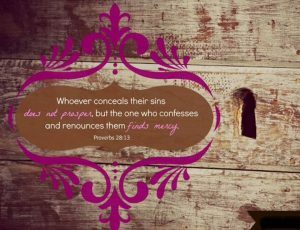 I want to be that one who confesses and renounces sins. Repent and receive forgiveness, as David did. Read Psalm 32:3-5 NIV. When I was younger, I wrongly assumed that spirituality was best evidenced by how long I could go without sinning. The greater the time that I walked without need of forgiveness, the better Christian I thought I would be. That was, and remains a subtle arrogance of self-will, and a faulty understanding of grace. None of us are innocent of sin. ”For all have sinned and fall short of the glory of God, 24 and all are justified freely by His grace through the redemption that came by Christ Jesus.” Romans 3:23-24 NIV. One’s Godliness may best be seen by how quickly you recognize your spiritual mess up, and how soon you confess your sin to God, and how fully you receive His forgiveness in Christ because you value your relationship with God more than you enjoy your sin. Sin is easy to enjoy at first, but its pleasures soon sour. The Bible describes, “the fleeting pleasures of sin.” Hebrews 11:25 NLT. Sin destroys anyone and anything it touches. I remember my maternal grandfather reminding me, “Allen, keep short accounts with God.” I have observed across a lifetime the wisdom of his words. Trying to never do wrong by your own strength of will is a quick and sure path to failure. Trusting Jesus to live His life in you and obeying the Holy Spirit is the road to the forgiveness and healing Jesus wants you to receive. Paul said, “Christ lives in me, and the life that I now live, I live by faith in the Son of God Who loved me and gave Himself for me.” Galatians 2:20 NKJV. Hallelujah! The path to God’s fullness and blessing is the same for you as for our nation, “If they humble themselves and pray and seek My face and turn from their evil ways . . then will I hear . . then will I forgive . . then will I heal.” 2 Chronicles 7:14. The first move must be yours, humbly and earnestly asking for God’s grace and mercy; the final move will be God’s and will always be gracious and merciful. Today I pray for you to live in His loving forgiveness and sufficient grace.